Tomorrow is an album from Wayne Newton, released in 1976. 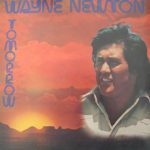 Wayne Carson Newton (born April 3, 1942) is an American singer and entertainer. One of the best-known entertainers in Las Vegas, Nevada, he is known by the nicknames The Midnight Idol, Mr. Las Vegas and Mr. Entertainment. His well-known songs include 1972’s “Daddy, Don’t You Walk So Fast” (his biggest hit, peaking at No. 4 on the Billboard chart), “Years” (1980), and his vocal version of “Red Roses for a Blue Lady” (1965). His signature song “Danke Schoen” (1963) was notably used in the score for Ferris Bueller’s Day Off (1986).